The first death of a pedestrian by an autonomous vehicle (self-driving car) has been confirmed by both the police and by Uber. 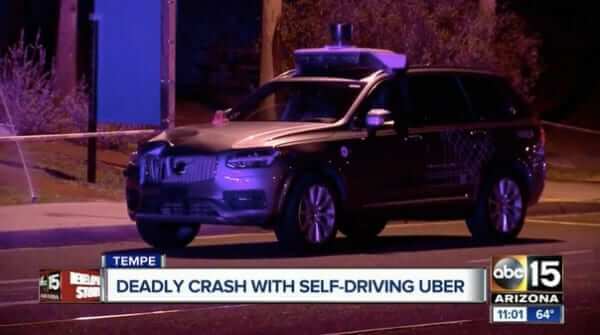 Uber’s autonomous vehicle struck and killed Elaine Herzberg of Tempe, Arizona, on Sunday, March 18th. News outlets are reporting that in response to the incident, Uber has halted its self-driving car programs in San Francisco, Pittsburgh, Phoenix and Toronto, although we could find no statement from Uber to that effect. No mention of “because maybe they are not as safe as we’ve been telling you.” Reading between the lines, it sure seems they are unwilling to admit that maybe self-driving cars aren’t as safe as the hype around them would suggest. “But what about autonomous vehicles that also have a human driver in them?” you may ask. Ah, what indeed. Here’s the thing. That Uber that struck and killed Ms. Herzberg had a human driver in it! In fact, that human driver is known as “the safety driver” (oh, the irony). To which you would be forgiven for saying “WTF is a safety driver for if not to make sure this doesn’t happen?” (it’s certainly what we said). It’s good that they are cooperating, but what we really want to know is what is the point of a ‘safety driver’ being “behind the wheel”, if it can’t avoid incidents like this? The first death of a pedestrian by an autonomous vehicle (self-driving car) has been confirmed by Uber. Uber's autonomous vehicle struck and killed Elaine Herzberg of Tempe, Arizona, on Sunday, March 18th. Deepest sympathies. I’m assuming the vehicle also has an automatic braking system in case of emergencies. If so, it apparently needs to be checked, hopefully in a simulator of some type. In the meantime, one can no longer assume cars will slow down while crossing the street.